PL · piersianowate Suborder: Apocrita Superfamily: Chalcidoidea The Perilampidae are a small family within the Chalcidoidea, composed mostly of hyperparasitoids. The family is closely related to the Eucharitidae, and the eucharitids appear to have evolved from within the Perilampidae, thus rendering the family paraphyletic (if the two families are joined in the future, the name that has precedence is Eucharitidae). As presently defined, there are 15 genera and >270 species worldwide. They are often brilliantly metallic (especially blue or green), with a robust mesosoma and a small, triangular metasoma (swollen and bulbous in Philomidinae). They are generally very strongly sculptured. The prothorax is typically very broad and disclike, and the labrum is multidigitate, a feature shared with the Eucharitidae. Another feature shared by Eucharitidae and Perilampidae is that the first-instar larvae are called "planidia" and are responsible for gaining access to the host, rather than the egg-laying female. 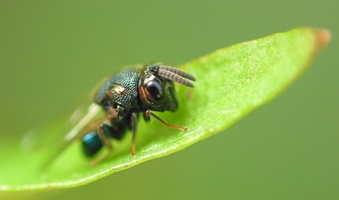 Those species which are hyperparasitoids will burrow into a secondary host's body and seek out endoparasitoid larvae such as tachinid flies or ichneumonoid wasps, and attack these.